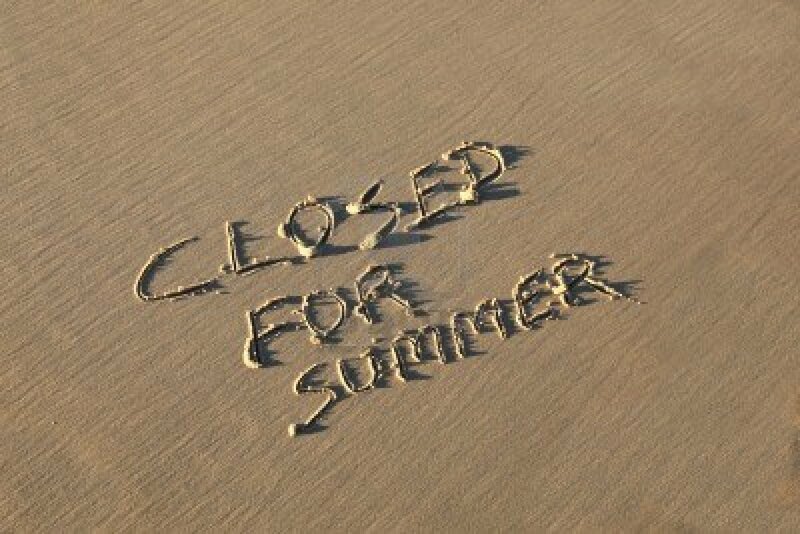 Our club is closing for the summer season and will re-open in September. If looking for information on leagues, please go to our league page. If looking for ice rental information please visit our Ice Rentals and facility page. We will be holding our Annual General Meeting on Wednesday, May 15th, 2019 in the club lounge at 7:00pm. All members are encouraged to attend as a quorum is essential. Agenda along with Proxy documents will be emailed to the membership in the next few weeks. 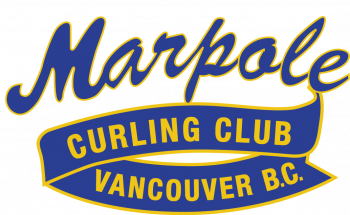 Marpole Honors the Top Ladies and Men’s Team in our Club Championship! Thanks to all teams who participated in this exciting weekend of curling! The ladies club championship was a best of 3, with Connie Bailey’s team grabbing 2 straight games to claim the top spot against Kenna Roald’s rink. The men’s club championship was a round robin, in which the top two teams were the 4 Horsemen (skip Gary Ritchie) vs Chris Gomes. The final game was head to head through 6 ends, with some exciting shots by both teams. Gomes was up 3 without hammer in the 8th to challenge Gary to strong finish, and held them off for the win. On a special note, two re-furbished trophies were presented to the winners with kind thanks to Darryl Pilkey for sourcing and giving them their new life! A special thanks to the club championship committee for organizing this event following the changes and challendges presented for the year. THE BEST OF THE BEST – Starts March 7th ! 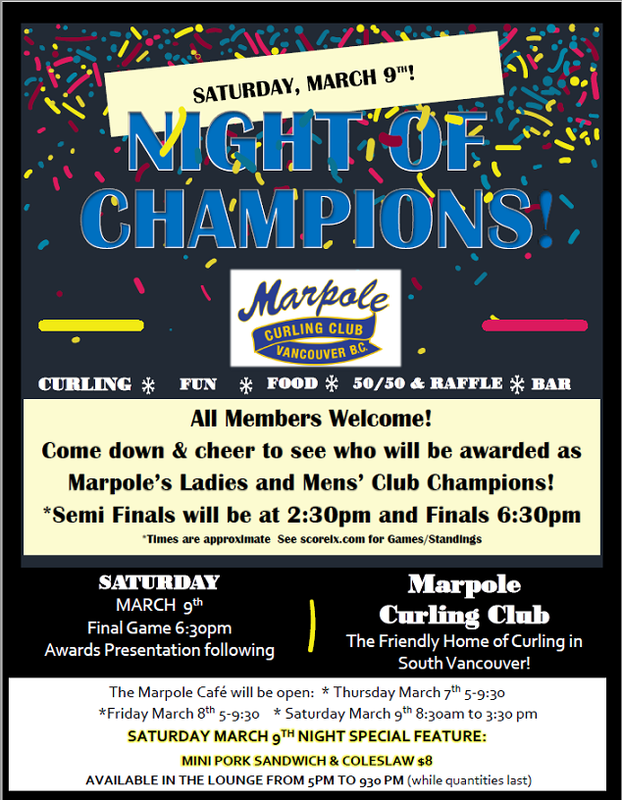 We are hosting our Marpole Men’s and Ladies Club Championship Thursday March 7th through Saturday, March 9th. The semis and the final round will be happening on Saturday March 9th. All members welcome to come down and watch some exciting, competitive events. The men will start on Thursday at 6:40pm, and the ladies will start Saturday at 11:30am. To follow the standings and game times, please click on the following link: http://scoreix.com/org/ne5Rdvbb2DoGoQdnS/event/RbYpPM6qSbH7YmNBR/games. Join us for food and fun ! In addition to the final games starting at 6:30 pm, we will be having 50/50, raffles and a special food feature! Following the final, we will celebrate the winners with trophy and award presentations to each team. The bar will be open Thursday and Friday night and Saturday from 11 am. 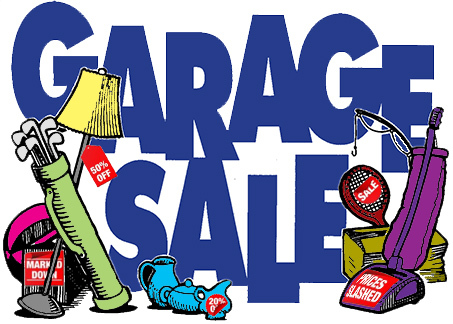 **Saturday night** we will feature a mini pork sandwich with coleslaw upstairs in the lounge for $8 from 5 to 930 (while quantities last). We hope to see you all down here to support our club champions and cheer them on!